This is the book you've been waiting for! Picking up where bestselling 90 Minutes in Heaven left off, Don Piper reveals for the first time the sacred, intimate details of the people who met him at the gates of heaven and the profound impact they had on his faith on earth.In this incredible follow-up to his eight-million-copy bestseller, 90 Minutes in Heaven, Don Piper shares untold stories about his encounters with people who greeted him at the gates of heaven, and offers powerful insights about the way for us to live our lives on earth. Don Piper's unforgettable account of a horrific car accident that took his life, and what happened next has riveted more than eight million readers. Something happened as he shared his story in the years since. Not only did Piper realize he had more to tell, he had yet to share the most sacred and intimate details of his time in heaven about the people who met him at the gates. 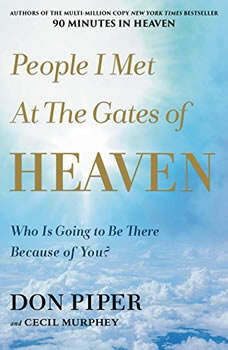 "I have never left a speaking engagement without people wanting to know more," he said in THE PEOPLE I MET IN HEAVEN, Piper takes readers deeper into his experience, which includes never-before-told encounters with the people who met him when he arrived in heaven-those who helped him on his journey that led to the entrance to God's heavenly home. Even more, Piper recounts the majesty of heaven and the glorious reunion that awaits us there. He offers practical insights, inspiration, and a challenging call that while we're on earth we need to obey Jesus' command to "go and make disciples of all nations."